Socrates (469 BC – 399 BC) was one of the greatest Greek philosophers. He did not propose any specific knowledge or policy. He showed how argument, debate, and discussion could help men to understand difficult issues. Most of the issues he dealt with were only political on the surface. Underneath, they were moral questions about how life should be lived. Such is the influence of Socrates that philosophers before him are called the Presocratic philosophers. Socrates made enemies, three of whom brought charges against him. Socrates was tried for his life in 399 BC, found guilty, and put to death by drinking hemlock (a herbal poison). The story of his trial and death is the subject of a tract by Plato which is called the Apologia. Most of what we know about Socrates comes from the works of Plato, who was his pupil. Socrates lived in the Greek city of Athens. His method of teaching was to have a dialogue with individual students. They would propose some point of view, and Socrates would question them, asking what they meant. He would pretend "I don't know anything; I'm just trying to understand what it is you are saying", or words to that effect. This is now called the Socratic method of teaching. Socrates is sometimes called the "father of Western philosophy". This is because in the discussions he uncovered some of the most basic questions in philosophy, questions which are still discussed today. Some of the people he taught came to be important and successful, like Plato and Alcibiades. Socrates never wrote anything. All of what we know about Socrates is from what other people wrote about him. Our main source of what we know about Socrates is from the writings of his student, Plato. Some of Plato's dialogues, such as the Crito and the Phaedo, are loosely based on fact. They are not written records, but artistic re-creation of Socrates in action. Another of Socrates' students, Xenophon also wrote about Socrates. Aristophanes, a person who wrote brilliant satirical comedies, wrote about him in play called The Clouds. Socrates was an easy target for satire. He walked barefoot, and with a swagger. Sometimes he stood in a trance for hours.p8 In The Clouds Socrates is a crazy person who tries to scam people out of their money. Plato wrote that Socrates taught for free. We do not know if Plato's description of Socrates is accurate or not. That is called the 'Socratic problem'. While a lot of what Plato wrote about Socrates is accepted by historians, some believe that Plato (who saw Socrates as a hero) portrayed Socrates as a greater man than he actually was. Some think that Plato was using the character of Socrates as a tool to express his own opinions rather than to accurately write about Socrates. This is what makes Socrates such a mysterious historical figure. Plato's dialogues are works of art, finely written. The general view is that they are based on reality, but no doubt adjusted for the purpose of writing. Socrates' father was a sculptor, and his mother was a midwife who helped women give birth to children. He may have been a stonemason like his father, and Plato wrote that he served in the Athenian army as a hoplite (heavy infantry). We know he was influenced by an older philosopher, Archelaus, and that he talked with anyone who had interesting ideas in Athens, but beyond that nothing is known. Socrates was about 50 when he married a much younger woman, Xanthippe. They had three children together. Socrates made complaints about his wife, but no one knew if he was telling the truth. It is said that one of Socrates' friends went to ask the oracle at Delphi if there was anyone wiser than Socrates in Athens. The oracle said that there was no wiser person. The oracle was well known for saying things that were ambiguous or unclear. It did not say that Socrates was the wisest, just that there was no person wiser. After being puzzled by this, Socrates finally decided that his wisdom lay in knowing that he was ignorant. His attempts to show the citizens that some of their ideas were nonsense might help explain his unpopularity. In Plato's works, Socrates says he knows nothing, but can draw out other people's ideas just as his mother helped other women to give birth. Crito, a friend of Socrates, illegally paid the prison guards to allow Socrates to escape. Socrates, however, decided not to escape. When Socrates was put on trial, he gave a long speech to defend himself against the claims made by the Athens government. 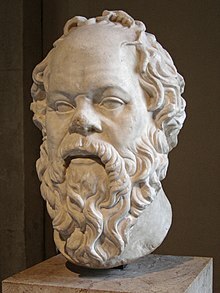 When Socrates was asked to propose his punishment, Socrates said that the government should give him free dinners for the rest of his life for all the good that he did for society. The court held a vote between giving Socrates a fine to pay or putting him to death. The verdict was that Socrates was to be put to death. Socrates did not fear death. He did not try to avoid death by apologizing for his actions because he thought it was morally right to stand by his principles. Socrates was ordered to drink a cup of hemlock (a poisonous liquid got from the plant). He drank it and died soon after. Apologia, or The Apology. This deals in particular with Socrates' defence at his trial. It is regarded as accurate in substance, and perhaps in detail. Crito. This deals with the month between his trial and his death. In particular, Socrates explains to his friend Crito why he is not going to escape, or permit his friends to bribe the jailor. Phaedo. This is a later work. It is written as if by an eye-witness of the last day of Socrates' life. In the work, Phaedo of Elias reports to a group of friends on what Socrates said on his last day. This is called a "reported dialogue" or one dialogue inside another. The Phaedo is longer than the other two works. Socrates helped people to see what was wrong with their ideas. Sometimes they liked this, sometimes they were not happy or grateful. He said that he, Socrates, was not wise, but that he "knew that he knew nothing." Since other people think they know something, but no one really knows anything, Socrates claimed he knew more than anyone else. He said that people who do bad things do so because they do not know any better. Socrates is seen by some people as a martyr, since he willingly died to support the idea that knowledge and wisdom are very important to our lives. Socrates is known as one of the most important philosophers in history. He is often described as the father of Western philosophy. He did not start Western philosophy, but he had a big influence on it. Before Socrates, philosophy was mainly about mathematics and answering questions about our natural world. Socrates expanded on that and added questions about ethics, politics, and epistemology to philosophy. ↑ Guthrie W.K.C. 1962. A history of Greek philosophy. Cambridge University Press, London. Volume 1 The earlier presocratics and the pythagoreans. Volume 2 The presocratic tradition from Parmenides to Democritus. This page was last changed on 19 January 2019, at 16:47.